Members of the Knights of Columbus 4212 served rigatoni, meatballs and salad that were prepared by the ladies of St. Joseph Calasanctius Church. The Jefferson Garden Club provided flowers to be given to each veteran. Patricia Fisher, clerk/ treasurer for the Village of Jefferson and president of Jefferson’s Chamber of Commerce, has involved herself for 23 years to bring together the community and honor veterans. Typically, approximately 70 veterans make it out to the luncheon to spend time together and be honored for their time in the service. When asked how this luncheon came together, Fisher described her idea. “My dad was a World War II Army veteran and served as a paratrooper. When I started at the Village of Jefferson, I had Veterans Day off to spend with my father, so I do this for him. I’d bring him along to these types of things, because Veterans Day was a day I spent with my father,” she said. The community that helped donate the lunch and desserts gave a warm welcome to the veterans as they approached the table to grab food. Jefferson is small, which allows a lot of us to work together, said Fisher. The Rev. Fred Grimm, a Navy veteran, ended his prayer by thanking the community and all who were involved with the luncheon for honoring veterans and acknowledging their service. “We give thanks this day for all the people that have been so kind to us over this weekend,” he said. Recognition to those who served was abundant throughout the luncheon, and Fisher mentioned future events the Jefferson Chamber will continue to involve the community in, including Memorial Day. “Here in Jefferson, we all want to recognize those that served. We have what we have because of them,” she said. 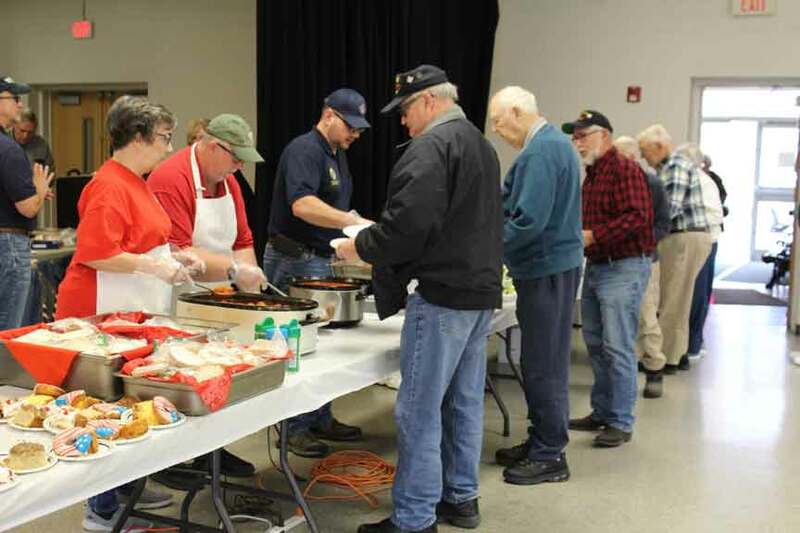 Veterans lined up for lunch served by members from the Knights of Columbus 4212.